PHOTO: ISU graduate student Jackie Nester hands over 950 petitions to Dean Wintersteen’s administrative staff. CAGJ’s AGRA Watch campaign is pleased to announce that the students we have worked closely with at Iowa State University on the issue of human trials of the GM banana delivered their petition today to the administration, with close to 1000 signers! There will be an Op-ed published tomorrow in Des Moine’s main newspaper. CREDO also launched their petition today, and quickly reached their goal of 10,000 signers, raising it to 25,000. As of 4pm PST there are close to 19,000 signers! 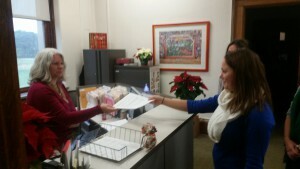 On Wednesday, December 16th at 9AM Iowa State University students delivered nearly 1,000 petition signatures to College of Agriculture and Life Sciences Dean Dr. Wendy Wintersteen. The petition, signed by over 990 individuals globally, calls on Dean Wintersteen to answer students’ and others questions about the current Gates Foundation-funded transgenic banana human trials underway at Iowa State University. The students request that her response be shared publicly, ideally through a public discussion with students and community members.